*not sure if they count or not. I've been to Big Bend. was there just this January! I tend not to think a spot of land is any more magical because it is designated a "national" anything, or "state" anything, which is why I don't keep track. Yeah, because having a little spot left that doesn't have strip malls, billboards, and ESPN/CNN/Fox News, and a neighborhood of cramped identical homes isn't important at all. I can't wait for the entire planet to look like Coruscan or Trantor 200 years from now! Seriously, at the end of my days, a bunch of preserved metal road signs have nothing on preserving a few places that are hundreds, thousands, or even millions of years old. oh, I agree with you completely on this. I hate development for the sake of development too... but, really, attempting to fence in the salesmen is treating the symptoms, not the cause. the solution to this problem is to kill all the buyers. but anyway, from the perspective of choosing which places to visit, I will go just as often for the "unsigned national parks" (see, Antelope Canyon for example) just as often as the signed ones. I'm a huge fan of the national parks -- Ken Burns' documentary "America's Greatest Idea" was a little bit sappy, but the title and general premise really got me to thinking about how lucky we are to be in this country with such an incredible amount of preserved space. Europe only realized what they lost when it was too late, everything was developed. Not only that, but most of what does remain is still in private hands - and usually guarded. Sad. I've enjoyed most of them from afar, but I've visited Acadia NP (3 times), Yosemite NP, Olympic NP, and Grand Canyon NP. I have been to two National Parks: Acadia and Rocky Mountain. - is anything on the freedom trail in Boston NPS maintained? Big Bend doesn't seem to me like it would be a National Park, though I'm glad it is. Going back again when they reopen Boquillas next year. I've been there twice, and I think it's a great national park. The canyons of the Rio Grande and the Chisos Mtns. are spectacular landscapes, and the desert scenery has its own sublime appeal. The Basin is one of the best campgrounds with a view I've ever set up my tent in. It's a great park for both roadside sight-seeing and hiking, mixing natural and historic sites for a superb overall experience. The Texas park I thought wasn't a big deal was Guadalupe Mountains NP, until my last visit where I got away from the car and did some serious hiking. The four trails I took -- McKittrick Canyon, Guadalupe Peak, Devil's Hall, and Smith Spring -- led to very picturesque sites. I would eagerly visit again just to repeat those hikes. I've discovered every park has its charms, even those viewed as unpopular in some circles. Steamtown NHP, for example, is widely panned for being too insignificant a site and "pork barrel" park, bu I enjoyed my visit there quite a bit and thought it did a great job interpreting the history of trains. Granted, I'd rather visit someplace where something significant actually happened, like Golden Spike NHS in Utah, but Steamtown was still worth a visit, as nearly every unit of the Park Service I've visited has been. But doesn't the Rio Grande have a large wall running alongside it? nope, not even close - there's always Mexicans crossing the river on horseback to try to unload their trinkets to US customers. Yeah so much for border security. There are 3 canyons there though with 800 feet high walls but there are places with no canyons. They are opening Boquillas in April with a small crossing, which should actually improve security. I wish they'd include 170 out to Presidio in the park, very nice area too. I wish they'd include 170 out to Presidio in the park, very nice area too. Most of 170 runs through the Big Bend Ranch State Park, so there is some recognition for the scenery along the highway. But I agree, that is a great drive and could certainly be part of the national park. I've traveled across the state when I was a child and had been to or through Kings Canyon and Sequoia National Parks, and the Grand Canyon National Park in Arizona a few years ago. I like to take my family (two sons and wife) to the nearby Joshua Tree NP, formerly a National Monument one of these days not in the summer, but up there the summers in elevations at 3,000-5,000 feet are 20 degrees cooler than in the desert floor. Why is Cuyahoga Valley in Ohio a Natl. Park? It seems like a political move that cheapens the entire system. Because it used be called a National Recreation Area. 2 more days on our trip. Decided to skip Royal Gorge and go to Great Sand Dunes NP instead (10 NPs & 3 NMs in 18 days). In Gunnison, CO right now. 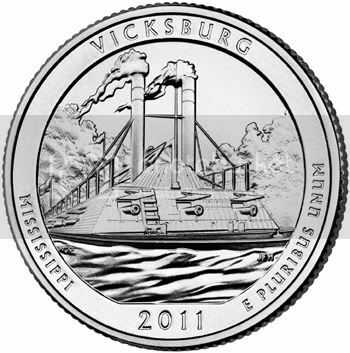 The new National Park quarter honoring Vicksburg's park is to be unveiled today at a public ceremony in the USS Cairo Museum, on the park grounds. 1: Yellowstone (Wy). Just so much to do there. Reading further in this thread made me remember I've been to Joshua Tree NP as well! So, adding that to be completely and accurate. I am really jealous of the people that have a complete national park set of stamps.. maybe i'll do that when i'm retired.. He has reproduction of all of the original WPA and have made 'new' posters for a number of different parks like Mesa Verde that never had one made. I have a total of five (Mesa Verde, Petrified Forest, Blue Ridge Parkway, Fort Marion (Castillo de San Marcos), and Great Smoky). I still need to purchase Shenandoah. I currently have Mesa Verde and Petrified Forest framed and they look great in the open entrance hall of our home. I recently purchased the latter three last year and just have to get those framed. As an aside, over the years I have made the National Park System, State Parks, and other attractions (like the Biltmore Estate, hockey and other sporting venues, things like that) as a reason for roadtrips vs. just pure roadgeeking purposes. The roadgeeking is an added bonus! This summer my wife and I are going to take a weeklong vacation visiting the Smokies, driving the entire BRP and Skyline Drive, visiting some battlefields and some Shenandoah Valley backroads, before finishing up at a family Reunion in Central PA. I've never driven the Blue Ridge Parkway in its entirety so I am looking forward to that!